This very small memorial is on the road to Weatherby. It stands about a mile from the Great Yorkshire Showground in Harrogate. It stands about 7 ft tall and "looks" over parkland. The poppies seem rather poignent and seem to suit the the faintly dejected air of the monument..
and of those who after leaving the Hospitals fell on the field of battle." "I am the resurrection and the life, he that beliveth in me though he were dead, yet shall he live"
Cannot fail to be intrigued by this memorial. Pasted below is an excerpt from the BBC website. "In 1914 Grand Duchess George of Russia came to Harrogate with her two daughters Nina and Xenia. The Duchess was the Greek wife of Grand Duke George Mikhailovitch, cousin of the Czar Nicholas II. She had left left her husband behind in Russia, where he was assassinated by the Bolsheviks in 1919. A month after the family's arrival in England war broke out. During the First World War the Duchess ran a number of hospitals in Harrogate for wounded soldiers. One of these was Heatherdene on Wetherby Road. 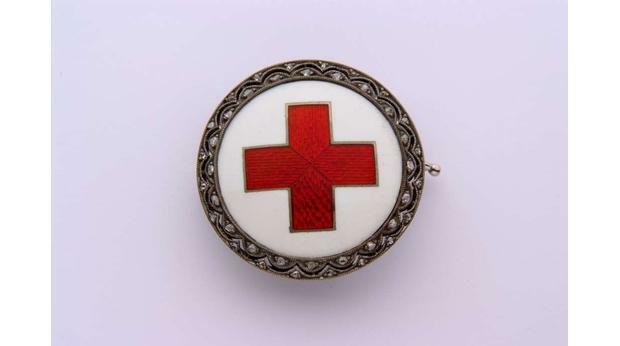 The Matron from 1915 was Christina MacRae and in 1917 Queen Alexandra presented a red cross brooch, made by Fabergé, to her during a visit to Harrogate. The Harrogate Herald of March 14th 1917 records that Nurse MacRae and three other nurses at the Grand Duchess's hospitals had been given awards for their services. In 1920 Grand Duchess George erected a war memorial to the soldiers who died in her hospitals. It can still be seen on the corner of Wetherby Road, next to the Stray. Heatherdene was later demolished. The brooch was later given to the Royal Pump Room Museum by a fomer colleague of Nurse MacRae. " "Heatherdene Cottage is the home of the Harrogate Hospital Sports and Social Club. It was originally the gardener's cottage of the Heatherdene Convalescent Home opened in 1892 as a memorial of the Victoria Hall fire disaster which occurred in Sunderland on 16th June 1883. A total of 183 children lost their lives when a fire broke out at a children's concert. The cottage has been extended and extensively modified to provide a comfortable bar area and a function room at the rear. Heatherdene Cottage is situated on Lancaster Park Road in Harrogate. The premises are on the opposite side of the road to the large District Hospital, approximately 50 yards from Wetherby Road. The Cottage lies between the entrance to the Ambulance station and the Heatherdene Nurses Residence.